How to wear flats in style! 40+ Style » What shoes to wear » How to wear flats and still look hip! How to wear flats and still look hip! I feature quite a lot of outfits with heels on this site. The fashion bloggers I feature like to wear heels a lot, and the women attending fashion week photographed by Denton will also wear them to make a fashion statement. I have also started to wear more heels as I get older, because I like how they can make an outfit more special. I can wear heels as I never have to wear them for very long. When I work at home I’m always barefoot. So some of you were wondering if you can also look stylish and hip wearing flats. The answer is a resounding YES of course you can! I also wear flats on a regular basis. My absolute favorite flats this year have been these flat white slingbacks. I wore them before here and here. They are super comfortable while being modern and hip at the same time because of their pointy toe. White is a color I wear often so these are easy to combine with many of my outfits featuring pants or skirts. Even though I have wide feet, I sized up to fit into these pointy flats and they have been really comfortable. Colorful Tom’s sandals with a pencil skirt and with white pants. I wore my flat silver booties with all the outfits in my winter capsule wardrobe, like with these cream and black skinnies. Pay attention to your golden ratio silhouette. You may need to increase the height of your tops in order to achieve the perfect 1/3 – 2/3 silhoutte or wear a tunic top. A lot of more info on golden ratio and silhouette can be found in my style course. You may like to add some extra funky jewelry. Try to get the hippest flats that you can find while still making sure they are comfortable. Right now, pointy toes are very current. If your shoes are mainly practical and comfortable, try to wear something a bit more special within your outfit. The asymmetrical top in this outfit will already draw a lot of attention, so statement shoes are not necessary. Some great shops for flats online are Nordstrom and Zappos. For those that need more supportive shoes, I have a great list of arch support shoes. For further reading also see an earlier article: how to wear flat shoes. How do you like to wear your flats? I love flats and wear them every day in some form or fashion. I think there are many many ways to wear them and look hip and you gave some great ideas. Don’t be afraid to have fun with any type of flat. I agree. I actually need a few more. Most of mine are getting old and I need some new funky ones! Yes capris usually look better with heels. I feel it works here because of the unusual top which lengthens. Me too, loving flats. I really enjoy those silver flat booties! Yes they were a great find! PS: Will save your post and next time I am posting about flats will include link back to yours. I wear more heels than flats as I always associated flats with comfort and practical reasons: in winter on icy paths, in summer when it is hot or when I am travelling. But meanwhile there are so many stylish flat shoes and currently I am looking for a pair of grey NIKE trainers for the in between-season. I tend to have equal amounts of flats and heels at the moment. I actually need to add a few more flats …. I’m not a huge lover or wearer of flats, but this past year, I’ve bought a whopping three pairs: silver brogues, pointed toe flats in black, and some black pointy brogues with silver chains. I’m thoroughly enjoying them all! 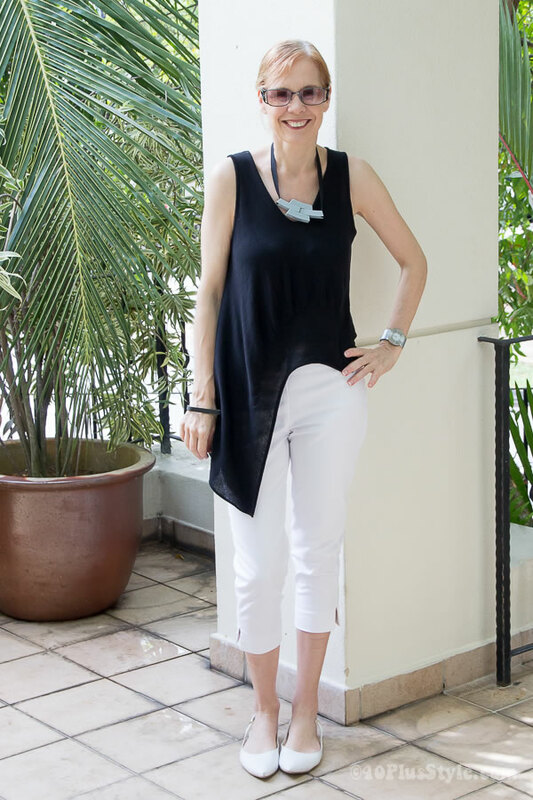 I may need some white sling backs like yours for summer…. I agree that it’s great just to have a few heels just to have a bit of fun with fashion and feel fabulous! This is such a good idea for a post. I find it really difficult to wear an outfit without heels and still look stylish. I like your tips, very useful! Try it Lorna. Have fun finding and wearing some great flats! You are right, this is a great outfit, yet ever so comfortable. Love your top and the jewellery with it. You do that so well. Yes, super comfortable. A true mom on the go outfit with lots of style! the older i get, the more i love comfort, which for me equals comfy shoes. that said, i DO still like to be stylish which is difficult so this is a great post. one thing i do wonder about however is why there are not more stylish in-between height shoes? why do they have do be either flat as a flounder or 3+”? 1.5″ would be great, even 2″ because often times ballet flats are worse to wear than heels! Yes I agree. I hope there will be some good options for this season. I will soon have a look and will keep you posted! I find that I prefer flats with a bit of a heel (1.5 – 2 cm). I find them more comfortable, and slightly more dressy. I have upon occasion had a shoemaker add 1 cm to the heels of flats to get what I wanted – it worked quite well. Yes, I do wear flats alot. Probably more than I should. Since I’ve changed my clothing style to “athleisure” flats seem to be the most appropriate looking.